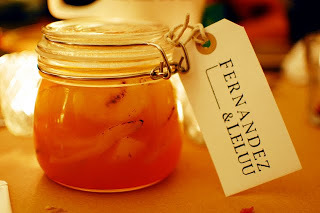 ferdiesfoodlab - London Supper Club - Battersea: Champagne Poached Pears w/ Vanilla. These were one of the highlights of the night - my attempt did not even come close last night. What sort of pears did you use - regular conference ones? They were just so poised as a dish. i could have carried on eating them all night long. These were just genius and the best dish of the evening. Very good of you to share your recipe but with my kitchen skills, I'd probably burn down my flat if I tried making these! These were lush - I would buy some if they were available, but I suppose I'd better dust off the flamethrower and make my own!